The key to a automatic transmission long life is how you keep the fluid fresh, clean, and cool. 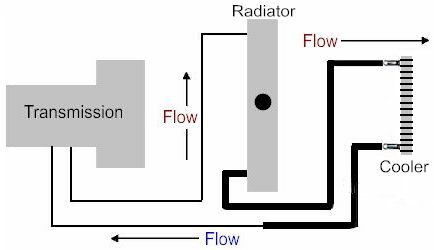 When fluid temperatures exceed the optimum operating range of 160°F to 200°F it begins to break down, decreasing the life of the fluid and in turn the life of the seals, bearings and all moving parts. Installation of a Transmission Oil Cooler with it's hose and pipe line will extend the life of the transmission and prevent costly repairs. Great upgrade for towing trailers or hauling heavy loads. Will not void your factory warranty. Pipe routing installed in series with existing transmission oil cooler mounted inside of the radiator.